Having so successfully worked with Johnny Depp in the Pirates of the Caribbean series, it comes as little surprise that director/co-writer (along with John Logan and James Ward Byrkit) Gore Verbinski would put together a superior animated feature that has as many laughs as telling bits of social/global commentary. Through misfortune, a domesticated chameleon (Depp swaggers through the role with customary bravado and charm) begins the task of searching for himself while warding off a voracious, over-sized red-tail hawk (the metaphors seldom let up) before landing in Dirt where the unknown traveller opts to take on a new persona, Rango. Then before you can say “O.K. Corral,” death-by-shootout is narrowly avoided even as the persistent hawk becomes fodder for vultures when a drier-than-a-bully’s-tear-duct water tower collapses on his feathers most foul. After a harrowing audition like that, it’s little wonder Rango is soon sporting the sheriff’s badge. His most ardent admirer comes in the delectable form of the desert’s finest iguana, Beans (done up with savvy and sauce by Isla Fisher). In order to seal the romantic deal, Rango does her bidding and opens an official investigation into the town’s withering supply of H2O. From there it’s a series of chases, setbacks, battles and quest for enlightenment that drives the action at a feverish pace. With so many references (intended or not) to The Music Man, having a quartet of musicians/singers comment artfully on the proceedings becomes the musical icing to the narrative cake. Kudos to Hemky Madera, Alex Manugian, Mark “Crash” McCreery, Joe Nunez and the toe tappin’ original music from Hans Zimmer. Paying serious homage to Apocalypse Now (replete with the “Ride of the Valkyries” for the air skirmishes and tight canyon sorties that will delight Star Wars fans) only a smattering of On The Beautiful Blue Danube could have completed the links to films past (all the better when that Stanley Kubrick moment does arrive—definitely a “pinch me, I must be dreaming” bit of suspension of all disbelief!). 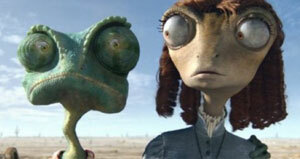 Pivotal too is Rango’s exchange with the Spirit of the West (Timothy Olyphant). All that was missing here was some trademark whistling as the echo of spaghetti westerns of yesteryear reverberated marvellously across the screen, laying the impetus for the call to action in the coda—everything now ready for the showdown with Rattlesnake Jake (Bill Nighy in top evil form).